Steal away to an orchard by the south coast in the country's newest national park. Natural and unspoilt sum up our peaceful Slindon Club campsite set in an orchard on the edge of Slindon Forest, National Trust owned bluebell woods, in the heart of the South Downs National Park. This 40 pitch campsite has beautiful views across the coastal plain of West Sussex and is home to a variety of bird and wildlife. Facilities on site are limited to a water tap and chemical waste point. There are many walks directly from the campsite through the surrounding woodland and estate which has 25 miles of public right of way and ten geocache boxes waiting to be discovered. The National Trust owned Slindon village is a stroll away and has a pub (The Spur) and community store - The Forge - which also serves as a café. Cyclists can have their pick of circular routes all starting from the village. The market town of Arundel, east of Slindon campsite, boasts a castle, a cathedral and the Arundel Wildfowl Trust – a 65-acre haven for wildlife. Parham House and Gardens at Storrington, Goodwood House to the east of Slindon, West Dean Gardens and Denmans near Chichester and are all interesting days out. 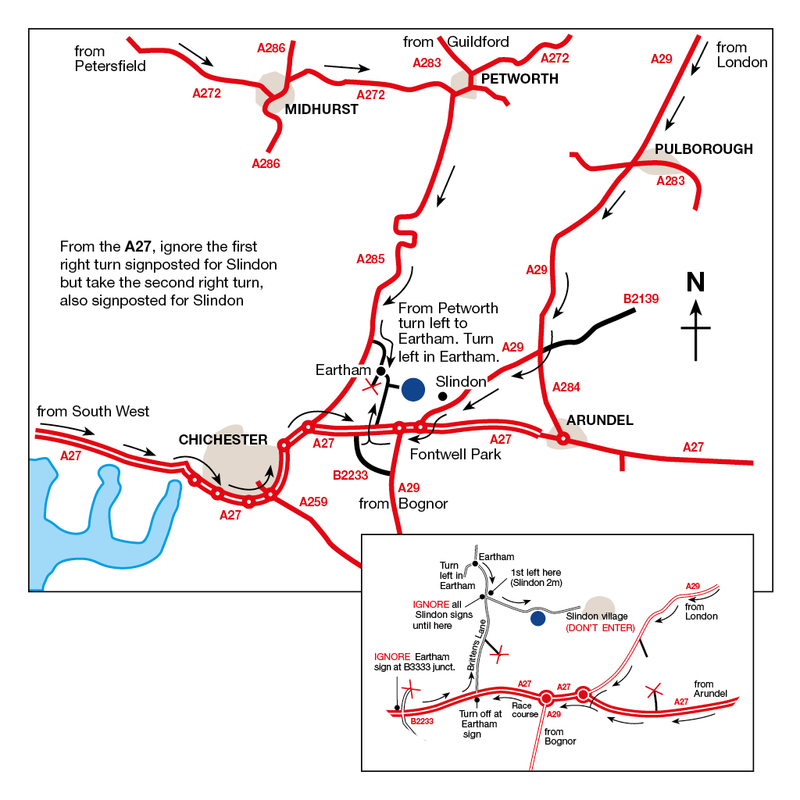 The Weald and Downland Open Air Museum and Amberley Museum might also be of interest. Beach lovers should head to the family–friendly beaches at Littlehampton, Bognor Regis and West Wittering. Restricted gateway needs careful approach when entering Site. Please follow the printable location map directions to the campsite carefully and do not tow through the village of Slindon - it is not suitable for caravans. This site has no toilet or showers so you’ll need suitable facilities in your unit. Only 20 caravans allowed on site. Originally a motte and bailey castle built in 1068, Arundel Castle is one of the most popular tourist destinations in the South Downs. In 1846, Queen Victoria spent some time here and the suite of rooms she stayed in are now knowns as the Victoria Rooms. Nestled in the South Downs, Goodwood Racecourse offers a lot more than just horse racing. Popular events include the Goodwood Festival, Goodwood Revival and the Festival of Speed. Chichester’s main attraction towers above the city. Founded in 1075, Chichester Cathedral is the only British cathedral with a surviving detached medieval bell tower. With Baroque-inspired architecture and a diverse collection of art, Petworth House is one of the must-see destinations when visiting the South Downs. Explore 700 serene acres of deer-park designed by world-renowned landscaper designer Lancelot “Capability” Brown. A peaceful site in the South Downs, near Petworth House and historic Petworth.